Jeff Taggart’s comments may be found in Part 1 of 4 at timecode 20:40. See link to Playlist at upper left of video, you can skip to other parts from there. If you don’t want to look at all four hours, you can scroll through the videos by dragging the button at the bottom of the screen and looking out for commenters you want to hear in the thumbnails that appear as you scroll. 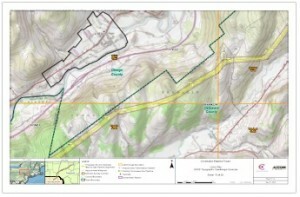 After repeated requests by the Franklin Town Board, Leatherstocking came to the May meeting to brief them on a possible natural gas distribution line to run from the proposed Constitution Pipeline through Franklin to industry in Fraser, Town of Delhi. (Both Morningstar Foods LLC and Clark Inc. could be large consumers of gas.) Probably this pipe would be low pressure ten-inch high density polyethylene, but medium pressure four-inch steel is an option. Either would be buried three to five feet deep. 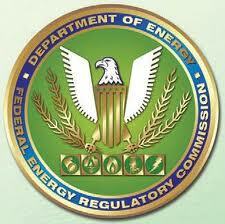 Leatherstocking Gas Company LLC is a joint venture between Corning Natural Gas Corporation and Mirabito Holdings. It has started constructing distribution systems in the townships of Bridgewater and Montrose, Susquehanna County, Pennsylvania. 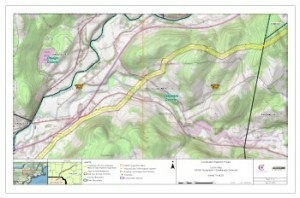 Mike German, president of Leatherstocking, showed two speculative routes. One would run 20.4 miles down County Highway 28 and State Highway 10 through North Franklin, Meridale, Meredith, and Delhi. The other would run 19.6 miles down Chamberlin Hill Road, State Highway 357, County Highway 14, and County Highway 16 through Leonta, Treadwell, and West Delhi. The latter is considerably different from the one shown last year to the councilmen of the towns of Delhi and Meredith, and to the trustees of the village of Delhi. That would have run down Otego Road to State Highway 357. Unlike the old, this new version does not go through the village of Franklin, and therefore to supply gas to the village a spur would have to be built from Leonta, a distance of 2.5 miles. Leatherstocking does not have the power of eminent domain and would have to negotiate for all easements. It could gain that power by becoming a utility. At the tap into the Constitution Pipeline (i.e. the station gate), there would be built a twelve foot by twelve foot utility building containing equipment to meter, reduce pressure, and odorize the gas. This distribution system would not require a compressor. This distribution line is contingent on the construction of the Constitution Pipeline. Even if that is completed by March 2016, construction of this line would not begin until 2017 or 2018. 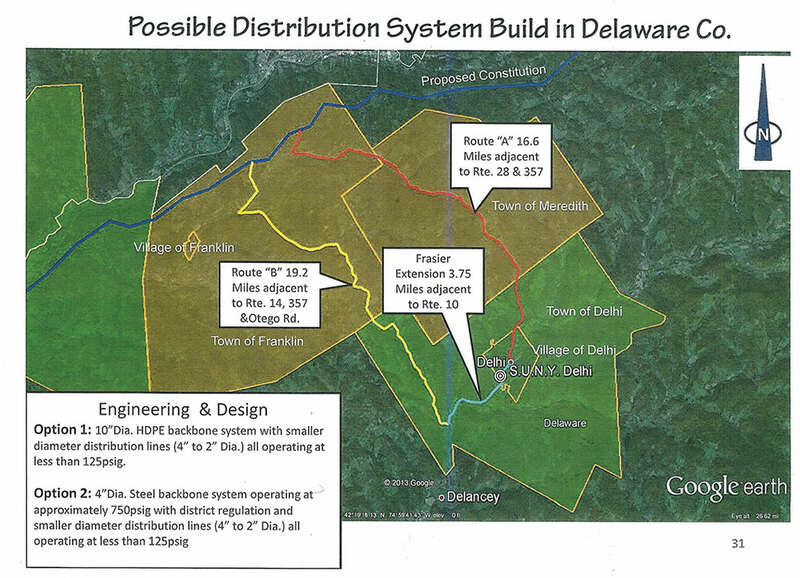 Prior to the Franklin/Delhi line, Leatherstocking is planning to build distribution lines from Millennium Pipeline to Windsor and then from Constitution Pipeline to Sidney. Other possible service areas are Bainbridge and Unadilla. In the spring of 2012, we began to hear about the Constitution Pipeline. People in Sidney were alerted first and the word soon spread. In northern Pennsylvania the population around Montrose began to realize that a new compressor was being added to their community. Doing some research, they discovered that it was to be the starting point for the Constitution Pipeline. This was denied by the industry for a while, but not anymore. In May, the Delaware County Cooperative Extension sponsored a public meeting in Franklin Central School with pipeline company representatives as well as forestry, soil and water experts who would be working with the DEC to enforce regulations. The last speaker was a lawyer offering to negotiate for landowners, explaining why and how they needed him to help them. So in June, Howard Hannum of Trout Creek, a member of Sustainable Sidney, a farmer and Postmaster of Sidney Center, decided to call a meeting at the Maywood Center so that those who do not want the pipeline would not have to fight alone. Community groups joined in, and over 250 people from Schoharie to Pennsylvania showed up. Stop the Pipeline (STP) was formed. We voted for a Steering Committee, put up a website and got to work. Our politicians got a lot of mail from us. We researched everything about gas pipelines, and the more we found out, the more determined we became to stop the pipeline. In August, STP got a big boost. One of the founding members, Anne Marie Garti, Delhi born and bred, is now a student at Pace University School of Law and a legal intern at the famed Pace Environmental Litigation Clinic (PELC). She discussed our situation with faculty members and PELC, which was founded by Pace Professor Robert F. Kennedy, Jr, who still operates it with Professors Karl S. Coplan and Daniel E. Estrin, and a team of ten eager third-year law students. This past fall, STP was honored to be invited to retain PELC as its legal counsel. In September, when the Federal Energy Regulatory Commission (FERC) announced that its first public hearings on the pipeline would be held in October in New Milford, PA, Afton and Schoharie, we were ready to testify. Our speakers outnumbered the pipeline supporters by thirty and forty to one. State and federal level politicians now took notice and tried to get us off the industry’s back with a proposed route along the I-88 corridor. None of us who had been researching pipelines believed that this was a serious proposal – too much of a planning and tactical nightmare – but legislators in Otsego County jumped at it, hoping to cash in on some industry handouts. Now, that route is ancient history. A third route has been announced which does not touch Otsego County. It is very much like the first route but it differs in an interesting way. More on that to follow. In October, after STP protested that more public comment hearings should be held along the route, FERC added a hearing at Foothills in Oneonta. Stop the Pipeline reached out again to other groups and together we got hundreds of people from Pennsylvania to Schoharie to rally outside Foothills before the meeting, and 800 people to pack the auditorium to capacity. Nearly a hundred made official comments. Of these, a mere handful – five people including the Mayor of Oneonta – spoke in support of the pipeline. When FERC invited comments about the pipeline on its website, once again hundreds of people responded. STP reached out to assist affected landowners with making comments on the FERC website and with sending letters to the Constitution Pipeline refusing to allow pipeline employees access to their land. And the interesting thing mentioned before is that when the third and latest Constitution pipeline route was announced, most of those property owners who had denied them access, found that they were no longer on it. STP is still reaching out to help anyone whose properties are on the route and to encourage landowners to submit letters denying access. 12 local community organizations are sponsoring this meeting. 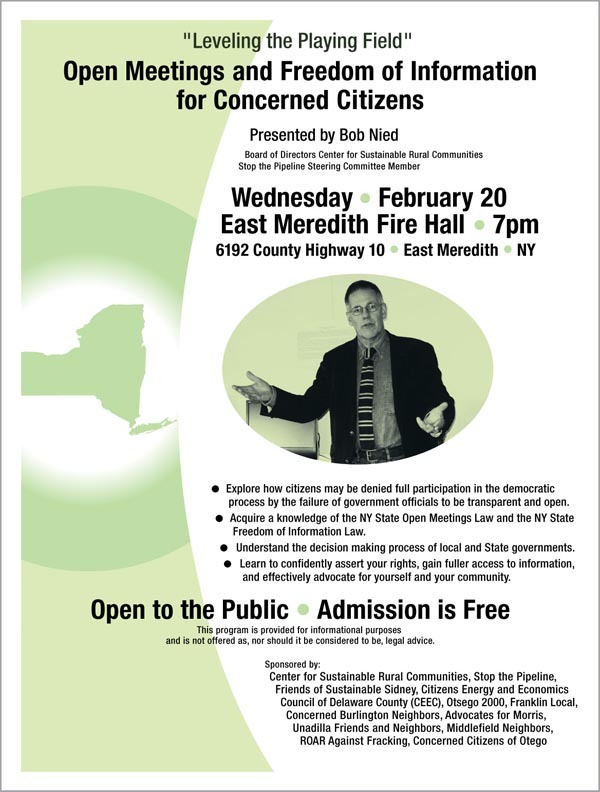 The presenter, Bob Nied is a board member of the Schoharie-based Center for Sustainable Rural Communities (CSRC). For the past ten months, CSRC has been working with Stop the Pipeline to organize and educate residents and landowners along the proposed Constitution Pipeline about the range of options open to them if they wish to resist its construction. CSRC is politically independent and does not endorse candidates, preferring to utilize public education, community outreach and citizen activism as tools for change. It has been a real privilege to work with Bob, who balances his temperate and rational argument with an (understated) passion for truth and justice. Revised Constitution Pipeline maps for the full route and for Delaware County are available below. 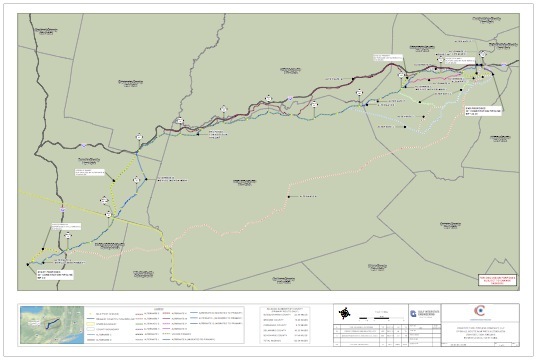 Revised maps for Susquehanna County (PA), Broome, Chenango and Schoharie Counties (NY) are available on the Constitution Pipeline website. Our Delaware County Board of Supervisors has been taking care of business — and doing it their own way. When they were offered presentations on gas drilling, our Supervisors heard one from the New York State Department of Environmental Conservation and one from the Independent Oil and Gas Association of New York. They refused to hear one from their own residents – they refused repeatedly. When IOGA-NY sent a letter to Albany in support of drilling for gas in the Marcellus Shale, it was signed by many business groups that stood to profit. Our Supervisors signed on — the only town or county government to do so. When residents took their protests about the lack of representation on gas drilling to the Delhi village square outside a scheduled meeting of the Board, our Supervisors abruptly canceled the meeting rather than talk with their constituents. Chairman Eisel claimed that the meeting was canceled due to a lack of business – an unprecedented excuse. 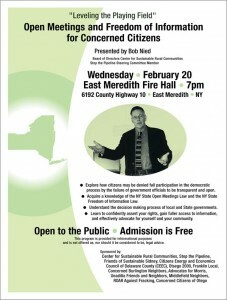 When New York City succeeded in getting from the State special protection from drilling pollution for their drinking water, our Supervisors demanded “reparations from the City and State for the mineral rights taken … of $81.3 billion to be paid over 60 years plus millions in real property tax revenues and lost employment opportunities;” or over $28,000 per year for each man, woman, and child living in Delaware County. (The Board was more likely to get the City to stock their reservoirs with mermaids.) Resolution No. 40 was passed by the votes of 12 out of 19 Supervisors – including Franklin Supervisor Don Smith. When the controversial Constitution Pipeline was proposed, a letter was sent in the name of our Supervisors to become an intervener at the urging of Chairman Eisel and Commissioner of Watershed Affairs, Dean Frazier. This “motion to intervene” was premature, made months before the project was even filed with the federal government. This was a waste of the lawyer’s time and our money — not our usual county lawyer but Watershed’s high-priced Albany lawyer. Elected officials have the obligation to collect the facts, listen to their voters, obey the rules, and act sensibly. 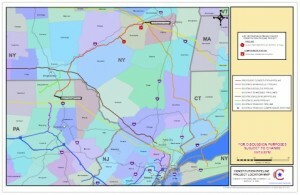 This map shows all alternate routes being considered for the Constitution Pipeline as of September 5, 2012. Testemony can be made in person at the hearing in the atrium of the Foothills Preforming Arts & Civic Center, Market Street, Oneonta on Wednesday the 24th of October from 7 to 10 pm. Written comments on any other aspect of the project can be made until the project is formally filed, possibly in January 2013. 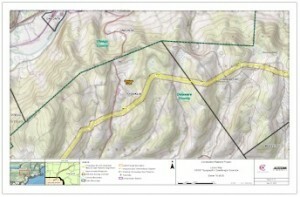 Maps from FERC: Constitution Pipeline – USGS Topo Map Excerpts 14, 15 & 16 for Franklin, NY. 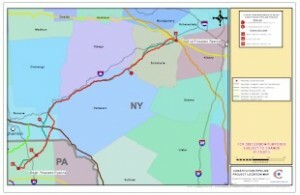 The proposed Constitution Pipeline will run from Susquehanna County in Pennsylvania to Schoharie County in New York, with a large part through through Delaware County, New York.